I was raised a “none”. That is, I was raised outside of organized religion, in a spiritual-but-not-religious home. I hear that “nones” are all the rage now, so I just want to point out for the record that for once in my life I was ahead of the fashionable curve. I obviously did not stay a “none”. I’m a pastor in the United Church of Christ and I try, for better or worse, to live my life according to the teachings of Jesus Christ. I am a Christian, not because I was told by family that I needed to be one, but because the faith spoke to me in a way nothing else did. In seminary I was aware of the uniqueness of my situation. Almost all of my classmates had been raised in the church, and most in the denomination of the seminary. A good number had been raised in the homes of clergy parents. They had grown up going to the same church camps, and knew the same people. I certainly never felt unwelcome because I hadn’t, but I was frequently aware of how radically different my journey to faith had been. But in the last few years, I’ve seen a lot of questions from Christian clergy about how we can reach out to the growing number of “nones” out there. Christians are baffled as to how the church should speak to this alien group. They confuse us. They challenge us. And, if we are really honest, their very existence threatens our sense of security. 1. Being a “none” is not always a bad thing. Truly. People come to faith from a variety of different places. For some that starts on the cradle roll at church, right after their parents bring their infant selves to the baptismal font. But for others of us, we arrive at the church via a different route. We explore other options, not because we are consumers, but because we want to find the place to which we are truly called. 2. “Nones’ are not Godless heathens. I attended a church conference at a large United Methodist congregation earlier this year and I was shocked to hear a speaker refer to non-Christians as “essentially heathens”. I’ve since heard that word used by others who seem to believe Christian faith is simply a battle for converts. I’m not sure how the “heathens” are supposed to respond positively to that rhetoric. The reality is that “nones” are not heathens. They are often extremely thoughtful, highly ethical, people who have not yet connected with an organized faith that speaks to them. When I first came to the church at age 17, I already knew I believed in God. I just wasn’t so sure I believe in church. Had someone insinuated that I was a “heathen” because I didn’t possess the same baptismal certificate as my classmates, I likely would have walked out the door. 3. “Nones” aren’t (necessarily) looking for a big conversion experience. I never had that mountain-top moment that revival preachers always say they had. I never fell to my knees crying. I never had a moment of sudden, clear belief. There was never an altar call. And that’s okay. I didn’t need becoming a Christian to be a melodramatic moment. Instead, I felt a small urging in my soul that called to me to take the next step, to keep asking the questions, and to keep exploring. Conversion was a gradual, and thoughtful experience. It also was, and is, continuous. Conversion is not a moment. It’s a lifelong process. While there may be moments that a Christian makes a deeper commitment, there are also countless moments of doubt, and of questioning, and of disconnection. These are not crises, but rather markers on the journey. But continual conversion means that a “none”, like any other Christian, ultimately is called to continue down the path of faith. 4. Churches need to check assumptions about common knowledge. Recently I heard someone complaining about visitors to their church that didn’t even know the Lord’s Prayer. She went on and on about how anyone could grow up not knowing the Lord’s Prayer. I felt those old feelings of embarrassment. And so I went home and started printing all the words to the Lord’s Prayer in my own church’s worship bulletin. “Nones” might not know all the right prayers, or when to sit down and stand up. And, believe me, they are conscious of not knowing. So we who are familiar with the language of church have to be careful that we are not making assumptions about shared language. Explain what might seem foreign. Talk about why you do certain things. You may find that even some lifelong Christians benefit from this. 5. Don’t dumb it down or make it easy. When I started looking for my faith community there were a lot of options. My town offered plenty of churches that wanted converts, and that handed out pamphlets about becoming a Christian and “making a decision” for Christ. They said it was so easy. Just accept Christ into your heart, and everything else would make sense. I never went to any of those churches. Instead I went to the places that didn’t try to make it easy. I found the ones that didn’t dumb it down. I didn’t want answers or to be entertained. I wanted to wrestle with the big questions. I wanted to worship in authentic community. I wanted to make the hard choices that faith demands. I wanted to follow Jesus. And I wanted a church that would show me how to do that. And, at the end of the day, I think a lot of “nones” might like that too. Even though I grew up as a Christian (with some rather lengthy detours, I might add), I still find myself identifying with what you are saying – wrestling with the difficult questions, and facing hard choices in life. Thanks for writing it like it really is. I cried every day for the first month of seminary. I was a “none” and felt everyone was soo much smarter than I was. What I soon learned was that I was hungry for anything and everything I was learning. No pre-conceptions, no bias, just an open heart and open mind. This post really resonated with me. Thank you. I remember feeling so far outside the loop in seminary. Everyone knew each other from some other place. But, like you, I was hungry. And I found that especially when I started preaching I could really develop my own voice. I wasn’t having to live up to a childhood preacher’s voice or ideas. I was free to be my own person. First seven years of my life, I lived with my brother, parents, dad’s mom, and dad’s mom’s mom. None of us went to church. After we moved out of grandma’s house, my mom took me to the local Evangelical Free Church. (She and my dad didn’t attend.) I was really involved: Sunday School, Vacation Bible School, Youth Group, Evangelical Camp. But I didn’t fit in with the other kids, and by High School I was gone. When I got engaged, I got involved with, and baptized in, the group (Bible Students) where my future father-in-law was an Elder. In the end, I didn’t fit there, either. The divorce certainly didn’t help. * I didn’t know the Lord’s prayer completely right, and besides, this church said it differently. The amazing thing? On my first visit to that church, I was approached by a clergyperson (not the pastor), and asked to help put together the women’s retreat. When I protested that this was my first time there, she assured me that she wanted my input. * People’s lives do matter. For people who’ve been outside the church for a while (or their whole lives), it’s affirming to have the church value their journeys. And their journeys are of value to the church, because it broadens the experience and wisdom of the body of Christ. Emily, your article here shares insight that can *never* come from growing up in the church, much less as a preacher’s kid. God bless your ministry. I’m just starting as assistant director of faith formation for elementary age students at our local parish. You words also ring true for those who aren’t exactly “nones” but are in the beginning stages of formation–which is–like you state, a life long journey. I appreciate your point of not necessarily making it easy or dumbing it down. Kids are particularly acute at knowing when they are being talked down to. Speak of faith–and times of doubt–honestly. In my experience, heathens follow an earth-centred religion which draws on traditions from northern Europe. I’m not sure what the word means in your head, but you seem to be using it as an insult. Using words which some people use as a self-identification as insults is seriously not cool. Actually, I wasn’t. I was saying those who used it as an insult were both inaccurate and wrong (and, as you say, that is indeed uncool). I’m another person who grew up as a “none,” in my case in a household that was not only not religious, it wasn’t spiritual either. ! 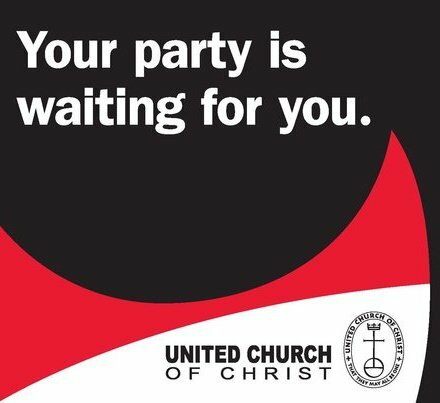 spent much of my teens and young adult years seeking, and ultimately wound up in the UCC. I recently finished serving several years as a deacon. Some of my favorite moments as a deacon came from serving communion by intinction to people who clearly had no clue what the procedure was. (Our bulletin sort of spells it out, but by the time people come forward, they’ve left the bulletin in their pew.) I could see the confusion on their faces, and so would whisper very matter-of-fact instructions to them — “take a piece of bread, and now you dunk it in the cup, and now you eat it” — and they would look both relieved and reassured. Because church suddenly became a place where they don’t have to know all the right protocols ahead of time — they’re welcome just as they are.